Urbana: University of Illinois Press, 1997. The Ghost Dance, which led to the 1890 massacre at Wounded Knee, was a widespread Native American religious movement. 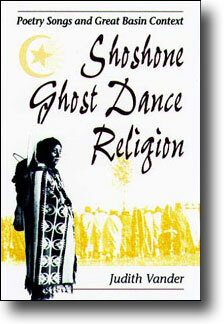 Shoshone Ghost Dance Religion demonstrates that the Ghost Dance was not a single religion, but had two branches--the Great Basin branch, a nature religion typified by Shoshone Ghost Dance songs (Naraya), and the Plains branch documented by famed anthropologist James Mooney in 1896. Based on extensive fieldwork with two Shoshone women in Wyoming, the book presents 130 Naraya songs, the largest collection of new Ghost Dance material since Mooney's publication. It analyzes the poetic texts, rich imagery, and musical style, demonstrating their high artistic achievement. Connecting the Shoshone Ghost Dance to the ancient religious traditions of the Great Basin, it provides the cultural background for understanding the intent of the religion and its songs.